Saturday 21st November saw over 300 of the very best in social care attended a glittering awards ceremony at The Belfry Hotel, Nottingham for the finals of the Great East Midlands Care Awards, where the category winners were announced. 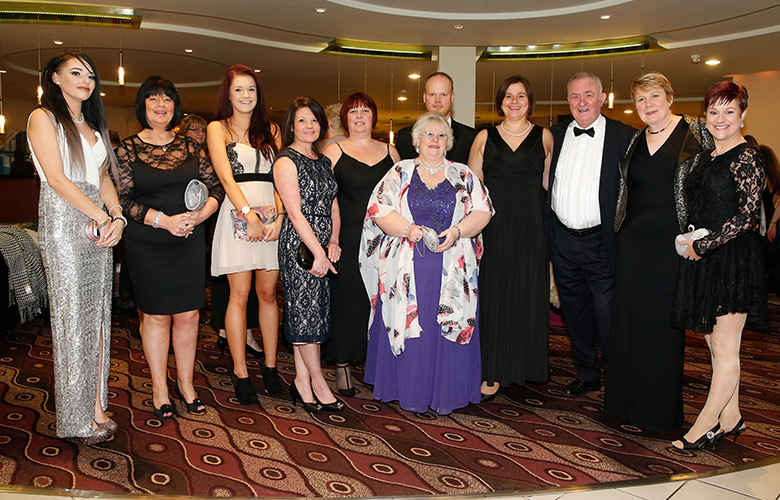 The Great East Midlands Care Awards, sponsored by Access Health & Social Care brought together the category finalists from across the East Midlands region. Winners of the Great East Midlands Care Awards will go through to the final at Birmingham’s ICC in Spring 2016. Milford Care Group really stood out because of their commitment to staff and the individuals they support. Both are empowered to develop their skills and talents and to take an active role in the company. Sally has a good balanced approach to providing care. Her diverse outlook on life and experience allows her to acknowledge difference and empathise with her wide range of residents. She works with people to get them to where they want to be without limits. Sally’s glass is never half full – it’s full! We chose Andrea for her warm, smiley nature and her understanding that the little things are so important. Andrea champions enabling the people she support with a ‘Let’s do it together’ and approach and makes a great cuppa! An outstanding example of a person that puts care at the centre of everything she does. Maryam goes above and beyond for the benefit of the people in her care and takes a proactive approach to ensure the wellbeing of others. Martha embodies everything that you would want in a care home manager. She radiates passion for the service that she leads. All of her residents and staff are important to her as individuals. She ensures that the care home and her residents are closely linked to the community and aims to make wishes come true. Mesha is an incredibly enthusiastic individual who thrives on providing a fantastic service. Herpassion for her job, her staff and service users wellbeing is inspirational and she has made tremendous improvements in a very short space of time which have made a considerable difference. Gillian said that taking time with her residents is the best job in the world. She has a the patience and perseverance to help a resident regain his dignity through food. The judges felt Gillian is a real star and asset to her organisation. Lorraine’s passion for her job is infectious. She demonstrates a willingness to stand out from the crowd and go the extra mile. Lorrain will defend the dignity and rights of the people in her care and ensure they are treated as if they were her own family. Paul’s enthusiasm and empathy shone through. He brings life skills and recognises the importance of treating everyone individually. He quoted several ideas that he has applied and developments in dementia care that he would like to implement. Ridgeway House has a great manager who encourages staff to think laterally and take calculated risks. A transparent and supportive team has evolved. Visiting nurse have commented on the home’s success having see it turned around in the last 12 months. Debbie looks forward to going to work every day and her career has changed her life for the better. She loves to have fun and party with her residents and also shows compassion, dignity and respect for residents and their families with the end of life activities. Diane presented her case in a very professional manner displaying clear leadership qualities. She evidenced that she shared her knowledge with junior housekeepers and is keen to train new staff. She is caring and passionate and a worthy winner. Sam has a great understanding of the issues faced by frontline care staff and business pressures. An innovative and dedicated trainer, Sam is a worthy winner. Briony is inspirational and puts residents at the heart of everything she does. Job satisfaction is a huge motivator for Briony. She truly loves her job and attends every residents’ funeral as for her they are like family. Liam is a very impressive young man who is new to the care sector and who has implemented some innovative management systems. He is extremely knowledgeable and committed to improving and growing the domcare service across a difficult geographical area. Gemma is passionate about fully understanding the people she supports in order to provide person centred care. She is motivated to make a difference by putting the individual at the heart of everything. Anne feels humbled about being nominated and oozes passion for what she does. Anne strives to enable independence and promote wellbeing by working in partnership with health professionals. For Anne it’s a vocation not a job. Mr Scott’s wife was a resident at Morton Grange from June 2013 to January 2014. She suffered with dementia which caused her to be confused, frustrated and agitated and she displayed some very challenging behaviour. Despite this she always responded very positively to her husband and they clearly doted on one another. She first came to Milford Grange for two weeks respite to give Mr Scott a break, as he had been coping at home with limited support but it was decided that it would be in her best interests to remain. Harry Scott has been a dedicated carer to his wife and is loved by all the staff. Julie has been a nurse for over 30 years, the last 26 years at Milford Care, devoting herself to the care of the elderly. In all that time she has remained bubbly, but above all very focused and professional in the care she gives. Julie delivers her nursing care with oodles of compassion not only to the people in her care but also when dealing with relatives’ worries and queries about their loved ones. Over the last 10 years Julie has been a mentor for overseas adaptation nurses. Julie’s wealth of knowledge as a nurse has earned her great respect from all her colleagues of whom she is very supportive. Since 1989 Julie has built up excellent working relationships with visiting professionals which goes a long way to establishing and maintaining an excellent reputation within the community. Her devotion to those in her care is exemplary, as is her contribution to the care sector. She is incredibly deserving of this award.